We all know that happened in 70 AD when the Romans destroyed Jerusalem and sent the Jewish population scattering around the world. Then the disciples asked three questions, “Tell us, when will these things be? What is the sign of Your coming and of the end of the age?" (Matthew 24:3). Jesus did not tell the disciples when these things would begin to happen. He did not tell them exactly what the precise sign of His second coming is going to be and He did not reveal when the end of the age would be. The end of the age is not the end of the world. 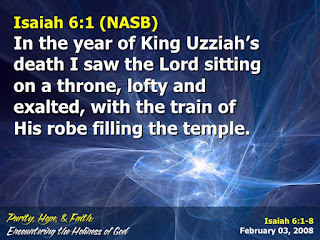 It is the end of the age of grace that will usher in the one thousand years Messianic reign. God is beautiful on many levels. His holiness is beautiful. ‘Give to the Lord the glory due to His name. Bring an offering and come before Him. Worship the Lord in the beauty of holiness’ (1 Chronicles 16:29). ‘When he (Jehoshaphat) had consulted with the people (in Israel), he appointed singers to the Lord so they should praise the beauty of holiness as they went out before the army and to say, “Praise the Lord, for His mercy endures forever’” (2 Chronicles 20:21).